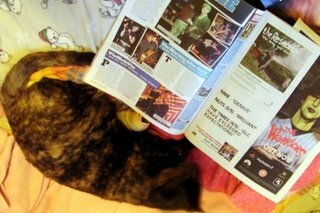 It's time to get Sputnik reading something a little more meaningful than the NME, methinks. Sassy as it is, all that music industry gossip will rot her brain. Nuthin' cooler than a hep cat, Barbara! HAPPY 2006, and cheers to ya! Hi Michelle, you sweet thing! Hope you had a great Christmas break. Cheers to you in 06 as well! I forgot to ask, how was the cham-beer? That sounds positively dreadful but I'm curious as all hell *wink*. Hey, you know what? It was actually quite nice. I've never been a huge fan of champagne - I find it too sweet and citric. But the cham-beer offered the best of both champagne and beer, if that's possible. I know you are fond of champagne, though, so I would imagine you would likely find this blasphemous. I'm glad you enjoyed! No measure of blasphemous rumours, blending and discovering new creations make up the curries of life. Besides, beer and wine-based drinks make up my summer "diet," how could I complain? It's all the gas (bubbles + foam) that make me queasy with uber expansion, heh. And for 'lil Sputnik, I hope the Dostoevsky doesn't dull her wily spirit. Might I suggest a little George Romero to keep her (and you!) on her game? It's too late for you, but there is still hope for the cat! Michelle, I think Sputnik INVENTED George Romero - she's that evil. Neil - you've found me out - nothing left in my brain but dry rot. I was absolute shocked at your quote of the day,,,,,,,,,,,,,,, how can anyone not love ZIM THE INVADER. Well, Anony ... there's no accounting for taste.